College of the Canyons defensive linemen Dorian Gerald (99) and Sione Taufahema (94) pass rush against Grossmont College on Oct. 1. John Bogna/COC Sports Information. 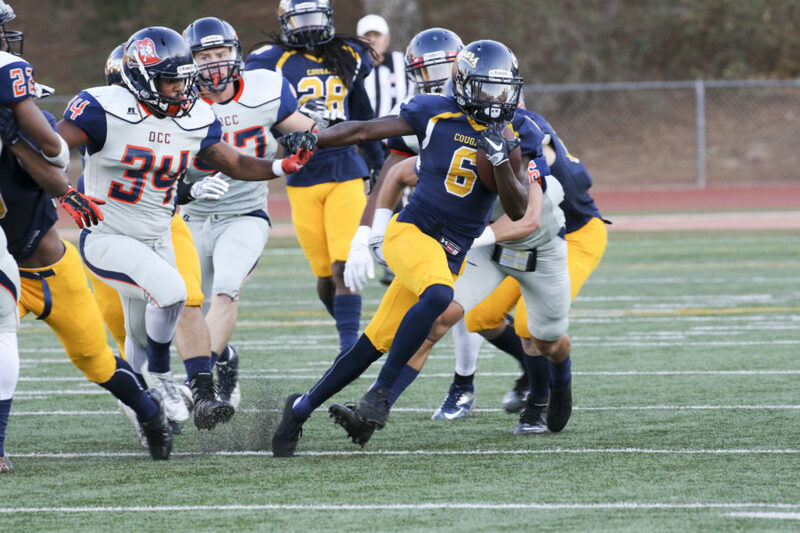 With the fall sports seasons coming to a close, a number of College of the Canyons student-athletes have been recognized with all-conference honors for their respective efforts. Included in that group were seven players from the COC football team who earned Southern California Football Association National Division, Northern League accolades. The Cougars had four players earn All-SCFA first-team honors and three named to the second-team. Included in the group of first team selections were sophomore offensive lineman Tyler Bjorkland, freshman wide receiver Marquise Brown, freshman defensive lineman Dorian Gerald and sophomore punter Austin McKinney. Bjorkland, a two-year starter for the Cougars, turned in a string of dominant performances in 2016 while starting all 11 games at left tackle. His contributions on the offensive side helped COC post an average of 350.2 yards of total offense (121.2 rush yards/229 passing yards) each time out. Brown also had a strong season for the Cougars, highlighted by 12 total touchdowns (10 receiving, one kick return and one punt return) and 1,341 all-purpose yards in 10 games played. He finished the year with a team high 50 receptions for 754 receiving yards, good for an average of 15.1 yards per catch. Gerald had a spectacular freshman campaign for the Cougars, with the South Carolina native starting in all 11 games while recording a conference-leading 12 sacks and four forced fumbles to go with 54 total tackles — including a team-high 24 tackles for loss. McKinney, who was a unanimous first-team selection, finished the season with 55 punts for an average of 40.1 yards per kick to lead the Northern League. He also pinned COC opponents behind the 20-yard line on 13 occasions. COC sophomore safety Blake Austin, freshman running back Tylan McBride and sophomore defensive tackle Sione Taufahema were each named All-SCFA Second Team. Austin ranked fourth on the team with 48 total tackles in nine games, including 7.5 tackles for loss. McBride led the Cougars with 595 rushing yards on 114 carries, good for an average of 5.2 yards per carry, while finding the end zone five times. Taufahema, who also earned All-SCFA second-team honors in 2015, finished his sophomore campaign with 24 total tackles, 2.5 tackles for loss and a sack from the nose tackle position. Cross country The COC cross country program concluded its season with a trip to the California Community College Athletic Association State Championship meet in Fresno, but not before seeing 12 runners earn All-Western State Conference honors. Results from the WSC Championship meet on Oct. 21 were subsequently used to determine All-Conference selections. Earning All-WSC first-team honors for the COC women’s team, which placed second in the conference, were sophomore Jessica Ruiz and freshman Stephanie Martinez. Ruiz also went on to finish eighth at the state championship meet with a time of 18 minutes, 36 seconds to earn JC All-American honors for the second straight year. As a team, the Cougars placed sixth at that event. Sophomore Chelsea Wells and freshman Díani Ellis were each named All-WSC second team, while freshmen Celine Whitman, Chloe Doherty and Taylor Hernandez were selected for honorable-mention recognition. On the men’s side COC finished sixth in the conference with freshman Garrett Noltemeyer and sophomore Jake Higdon both named All-WSC second team. Sophomore Mauricio La Plante, and freshmen Cody Roelofson and Christopher Ochoa were honorable-mention selections. The COC men’s team placed 21st at the state championships. Men’s soccer The COC men’s soccer team had six players earn All-WSC, South accolades after a season in which the Cougars placed fourth in the conference. Headlining the group of honorees were All-WSC first-team selections Adrian Arguello and Anthony Salvadori. Arguello, a sophomore midfielder, finished the season with one goal, a game winner against Citrus College back on Oct. 25. Sophomore defender and co-captain Salvadori started all 22 games and was a force for the Cougars on the defensive end. Earning All-WSC second-team honors were sophomore goalkeeper Cristian Arriaga and sophomore defender Kevin Rivas. Rivas, also a team co-captain, played in all 22 games and paired with Salvadori to provide a strong defensive presence for the Cougars. Those efforts were bolstered by the play of Arriaga, who posted a 1.59 goals against average while finishing with a record of 8-12-2. His 110 saves and six shutouts both ranked second in the conference. Honorable mention selections for the Cougars included freshman midfielder Aaron Winsick and forward/midfielder Jean-Daniel Lukubika Alves. Winsick played in 18 games while recording three goals and an assist. Lukubika Alves played in 16 games and finished season with a goal and assist.